I was browsing a famous ticket booking website for options for my return journey from Nellore to Bengaluru. 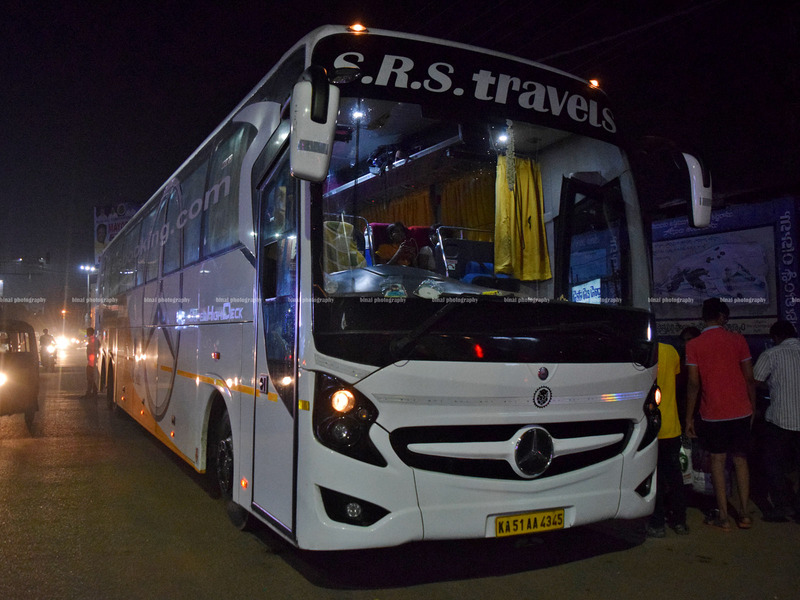 SRS Travels caught my attention - since the vehicle type was listed as "Mercedes Benz Multi-Axle". I checked on the SRS website and confirmed this information. 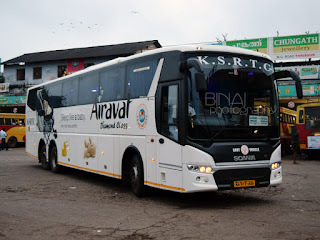 I further checked on facebook and ensured that the service was actually operated by a Mercedes Benz multi-axle coach. I booked my ticket through the SRS website, which guaranteed a discount on the ticket fare. The final cost of the ticket was close to Rs. 400 less than what I paid for the outbound! 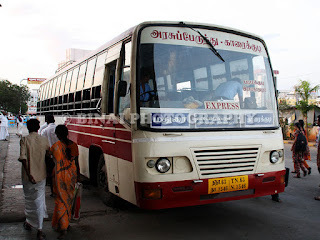 I checked out of the hotel at Ayyappagudi, by around 2030hrs - my bus was scheduled to depart at 2200hrs from Madras Bus Stand. I had called up SRS Travels earlier in the evening to confirm the location of the pick-up point, and had confirmed the departure time as well. I waited for a while to see if I could get a bus, but finally settled for a share autorickshaw, who dropped me near the bus station by 2100hrs. The first stop was to have my dinner - from the famous Muralikrishna hotel, and then some shopping at their sweets outlet. I moved to my pick-up point - opposite A2B restaurant nearby. I was asked to be there by 2145, and I was perfectly on time. 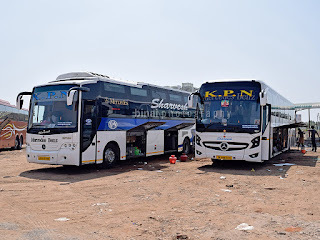 Two buses bound to Bengaluru (by other operators) were already there - this confirmed that I was at the correct place. A little after I reached the point, the driver called me up to confirm that I was at the boarding point. The bus appeared by 2157hrs - boarding commenced soon after. Majority of the passengers joined the bus at this point. The interiors were still wrapped in plastic - a very cheap look, to be honest. We waited for a while for more passengers to join in, and we got moving by 2210hrs - ten minutes behind schedule. The bus was noisy and bouncy - not as bad as my last ride in the Scania though. We passed Ayyappagudi by 2224hrs - and finally got on to the highway. The driver picked pace - the engine sound reduced a bit as the bus picked pace. Lights were turned off, and I searched for that comfortable posture to sleep. The AC was blowing at full force - I adjusted the direction and got ready to sleep. Meanwhile, a movie was played on the AV system. I was tired and exhausted from the heat - I fell asleep quickly. I had a nice long sleep,and woke up just as the bus was starting off from Tirupati (0048hrs) - my co-passenger had joined here. Although the bus stopped again nearby, I continued sleeping. That was one long undisturbed sleep - I woke up only as the attendant came around calling for passengers alighting at KR Puram. We pulled into KR Puram by 0509hrs. In a split second decision, I opted to get off at Tin Factory, and decided to take a metro towards my place. I got off at Tin Factory by stop by 0518 hrs - well before the scheduled arrival time! I took a BMTC bus to Baiyyappanahalli metro station, and then a train towards Nadaprabhu Kempegowda Station (Majestic) and then continued on the green line to Dasarahalli. Traveling early in the morning mean a long wait at Majestic for a connecting train (I had narrowly missed one, and the next one had a 19 minutes headway!). I got home well before 0700hrs - giving me enough time to catch up some more sleep before heading to office. Remarks: The bus, KA-51-AA-4345, had clocked a little over 1.21 Lakh kilometres. The bus was maintained in good shape - but the usual rattles from the Mercedes Benz was present here as well. The ride was on the bouncy side (thanks to the stiff suspension), but appeared better than my previous ride on the Scania. The seats were a bit uncomfortable - seat height appeared less - giving the feel of sitting on a low seat. The bus was noisy at idle, but got better as it picked pace. Overall a good journey. Charging Point: Available, did not use. Entertainment: Available, A movie played. Will I take this service again? Its a good option for people traveling on this route. You should try the Mercedes Benz SHD 2441. I heard they improved the engine and ride quality.